Dominique Lapierre’s Once Upon a Time in the Soviet Union, an account of a historic road trip across the USSR in 1956, has just been published in India by Full Circle Books. This isn’t an in-depth travelogue or a sociological study of the unimaginably vast enigma that was the former Soviet Union: that much should be clear from the size of the book (it’s less than 200 pages of text in the double-space format, which makes it more like 120 regular pages). But it’s a friendly starting point if you want a flavour of Russian life in the 1950s and aren’t yet ready for something of the scale of, say, Ryszard Kapuscinski's Imperium. What followed was a 13,000-kilometre road trip for Lapierre and Pedrazzini in the company of their wives and a young Russian journalist named Slava. Once Upon a Time in the Soviet Union is about some of the highlights of this long journey. The first thing to note is that it’s written in a very breezy style. The predominant tone here is that of the wonder of discovery; of young people who have taken individual freedoms for granted trying to grasp the workings of a very unfamiliar way of life. The joy of the experience comes across in much of the writing – there are descriptions (and photos) of people gaping at the colourful French car on their roads (“we were being scrutinized like exotic fish at the bottom of an aquarium”) and a running joke about how difficult it was for them to obtain high-quality fuel (he calls it “Muscovite elixir”) for the pampered vehicle. We shall know when he is dead, so sleep, little girl, sleep. Despite his claim that “these pages are an entirely objective account of the lives of Soviet citizens who spontaneously welcomed and opened their doors to us”, Lapierre doesn’t refrain from voicing his views about the subtle brainwashing, “the lack of any spirit of criticism” that was integral to the working of the socialist system; the hand-to-mouth existence of people not permitted to own land or start private businesses; and the belief, sustained by deep-rooted idealism, that the Soviet Union would last forever. This is most noticeable in his good-natured arguments with Slava, who is a member of the Communist Party. “Slava, how is it that the hotels in the USSR are generally so disgustingly filthy?” I asked him one day point-blank. “When they are dirty it is the fault of the person in charge,” he replied in a similar sharp vein. I was struck by the bond that develops between Slava and Lapierre despite their seemingly irreconcilable clash of ideologies and despite the things that happened after the trip ended. 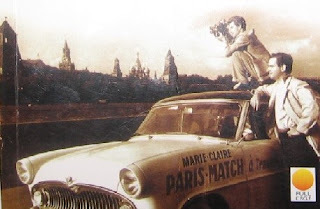 In February 1957, when the Paris Match published Lapierre’s long report of the journey along with Pedrazzini’s photos, Slava was taken to task by Soviet authorities who had expected him to keep a stern eye on the foreigners and were unhappy about the amount of information leaked out. Slava responded by writing a fiercely critical article about Lapierre in a Russian paper, also publishing a photograph he had surreptitiously taken (and which is included in this book) of Lapierre scaling the gates of the Livadia Palace during off-hours. Despite this attempt at redemption, Slava was exiled to Siberia for three years, and yet, Lapierre relates that when the two men met again in 1962, “we hugged each other with a joy that showed we had both buried our grievances”. Seems like a nice read. Reminded me a lot of the Motorcycle diaries, albeit minus the clash of ideologies and the results of the discovery. In a way with all the walls down- the world is less exciting. Do you think any less of Kapuscinski despite the surge of criticism about him in recent times? for a while i was pissed that the book which i thought was all factual now has a question mark on it especially as regards the facts. because that they were facts was a very important aspect of its influence on me. took me a while to come to the current conclusion that why should influences be only real? this (www.slate.com/id/2158496/)spirited defence not withstanding the idea of literary license in non fiction writing is still unpalatable. guess i have to blame my sketchy journalistic background for that. anyway, been a while since i have been around these parts. congratulations on your wedding and nice to see more of your articles in MSM. theidiot: welcome back - good to see you here again! And thanks for the wishes. Incidentally I also don't get the naiveté that allows some people to think of an autobiography or biography (even the ones that are written honestly) as "factual" in some overarching sense, when they necessarily reflect the sensibilities, perspectives and biases of the authors. All this said, I can understand your disillusionment about reading the Kapuscinski, feeling very strongly about it as a completely factual, journalistic account and then finding out about the made-up stuff. The reaction must vary from reader to reader, I suppose.